Fast-acting and gentle, ENZOL Enzymatic Detergent presoak-plus-cleanser allows instruments to be thoroughly cleaned before they are high level disinfected or sterilized. The proteolytic enzyme in ENZOL Enzymatic Detergent effectively penetrates and lifts off tough, dried-on, hard-to-reach organic matter. 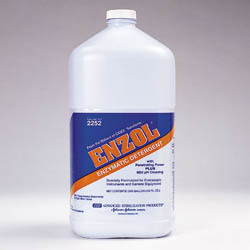 Specially formulated for endoscopes and general medical equipment, ENZOL Enzymatic Detergent can be easily used anywhere instruments are processed, including GI labs, operating rooms, central supply, OB/GYN offices, outpatient surgery centers, and physician offices.